The FastDiet co-author and test case Mimi Spencer (pictured) shares how she incorporated the weight-loss plan–which includes two days of “fasting” (consuming 500 calories)–into her busy, working-mom lifestyle. 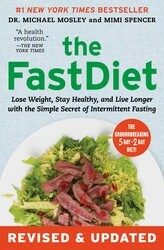 From The FastDiet: Lose Weight, Stay Healthy, and Live Longer with the Simple Secret of Intermittent Fasting, with co-author Michael Mosley. While most men I know respond well to numbers and targets (with associated gadgets, if at all possible), I’ve found that women tend to take a more holistic approach to fasting. As with much in life, we like to examine how it feels, knowing that our bodies are unique and will respond to any given stimulation in their own sweet way. We respond to shared stories and the support of friends. And, sometimes, we need a snack. Personally, for instance, I like to consume my fast-day calories in two lots—one early, one late—bookending the day with my allowance and aiming for a longish gap in between to maximize the prospect of health gains and weight loss. But I do need a little something to keep me going in between. A fast-day breakfast is usually a low-sugar muesli, perhaps including some fresh strawberries and almonds, with 1% or 2% milk; there’ll be an apple for lunch—hardly a feast, I know, but just enough to make a difference to the day. Then, supper: a substantial, interesting salad with heaps of leaves and some lean protein perhaps smoked salmon or tuna or hummus—once the kids are in bed. Throughout the day, I drink mineral water with a squeeze of lime, tons of herbal tea, and plenty of black coffee. They just help the day tick by. In the four months since I started the FastDiet, I have lost 13.2 pounds, and my BMI has gone from 21.4 to 19.4. If you’re struggling with bigger numbers than these, take strength from the fact that heavier subjects respond brilliantly to intermittent fasting, and the positive effects should be apparent in a relatively short time. These days, one fast a week (on Mondays) seems to suffice and keep me at a stable, happy weight. Many women I encounter are well versed in dieting techniques (years of practice), and I’ve found a couple of tips that come in handy on a fast day. I recommend, for instance, eating in small mouthfuls, chewing slowly, and concentrating when eating. Why read a magazine, why tweet as you eat? If you’re getting only 500 calories, it makes sense to notice them as they go in. Like many intermittent fasters, I have found that hunger is simply not an issue. For whatever reason—and one wonders whether it suits the food industry—we have developed a fear of hunger, fretting about low blood sugar and whatnot. On the whole, for me, a day with little food feels emancipated rather than restrictive. That said, there are ups and downs: some days skip by like a pebble on water; other days, I feel like I’m sinking, not swimming, perhaps because emotions or hormones or simply the tricky business of life have kicked in. See how you feel, and always give in gracefully if that particular day is not your day to fast. Revised and updated with new science, recipes, and tips for easy fasting, the #1 New York Times bestselling diet book from Dr. Michael Mosley! Is it possible to eat normally—five days a week—and become slimmer and healthier as a result? Simple answer: yes. You just limit your calorie intake for two nonconsecutive days each week—500 calories for women, 600 for men. You’ll lose weight quickly and effortlessly with The FastDiet.